The best part of astronomy for Research Scientist Michael Endl is the "excitement of discovery," he says. Mike uses his time at McDonald Observatory to search for extrasolar planets, that is, planets around other stars. He says that nothing he has seen recently can compare to the moment in his student days when he discovered his first extrasolar planet. While working with another student at an observatory in South America, Mike says they looked on a computer screen at the signal from a star, and their jaws dropped. "We actually found a planet!" he recalls. And for a short time, they reveled in the knowledge that they were "the only guys on Earth who knew that there is a giant planet orbiting that star!" This, Michael says, is the greatest reward of doing astronomy. "It's the incredible feeling," he insists, "to have found something totally and completely new." "I was an avid amateur astronomer." Michael has always been a loyal astronomy enthusiast, even as a child in Vienna, Austria. At age 10, he built his own refracting telescope. However, it was not always obvious that he was destined to become a professional astronomer, especially towards the end of his high school career. "I became a computer nerd," he laughs, "but I really didn't like it." So much so, in fact, that after starting out with a job working on computers, he decided to attend the University of Vienna to study physics and astronomy. Later, he was able to spend two years studying in Chile before finally receiving his Ph.D. He came to the University of Texas as a post-doctoral fellow to look for extrasolar planets after finishing his degree in Vienna. "It might have been ugly if I had really fallen in." As a native Austrian, Mike is very familiar with big mountains. "I love mountain climbing," he says, "especially in the Himalayas and the Andes." 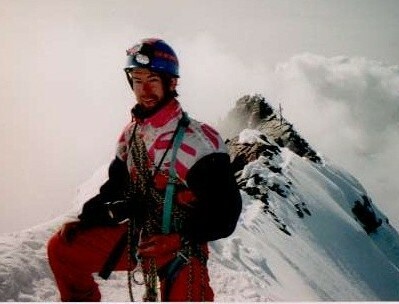 The highest mountain Mike has ever climbed is called Aconcagua in the Andes. The peak rises almost 7000 meters (23,000 feet) into the air, and while there is an easy path to the summit, Michael and his partner chose to scale a more difficult ice route instead. "Up near the summit, I broke into a crevasse," he recalls. "It was funny because I saw it, but it was bigger than I thought." Michael pulled himself out on the other side and warned his partner about it. Because of the very thin air at that altitude, even jumping over the small gap was a true feat. "We had to laugh," he says, recalling the several minutes they had to spend panting and recovering from this mini-adventure. "But it might have been ugly if I had really fallen in." "I think it's too early to tell." Like his ability to work on different continents and climb in varied environments, Mike's opinions about life elsewhere in the universe are quite flexible. He certainly thinks that such life exists, but whether it is simply single-celled bacteria or beings that are intelligent remains to be seen. "I think it's too early to tell," he says, adding that new technology might shed more light on the subject. Better telescopes that will become available to astronomers within the next 20 years should allow them to find Earth-sized planets, and possibly even signs of primitive life. Michael, however, asserts that he "has an open mind." He is ready for anything.